Blemishes, also known as acne, zits and pimples, are a skin condition that form as a result of excess oil and skin cells that have become clogged inside your pores. Blemishes can occur almost anywhere on the body, but are most commonly observed on the face, neck, back, shoulders and chest. However, you may notice acne on the upper arms, buttocks and areas of the body where you sweat. Blemishes look like raised bumps on the surface of the skin that can vary in size and may have a white, red or even black appearance. These blemishes can become infected, causing pain, inflammation and even scarring once the acne has healed. Acne is often dictated by genes and the hormonal changes that come with the surging hormones and increase oil production of puberty, pregnancy and even adulthood. Many people think that eating greasy foods causes acne, but this is a common misconception. Most teens will develop at least mild acne, though some may never have a problem with it, and others may develop a severe case. Severe acne can have a negative affect on your quality of life and self-esteem, and can even contribute to anxiety and depression. Some people, particularly teens, may become shy or embarrassed and may start to avoid social situations or having their photo taken. Adults who develop acne later in life are usually unprepared and may find the appearance of blemishes stressful and humiliating. However, with the technology and medications available today, there are ways to treat and prevent virtually any type of acne. Whiteheads form as the result of excess oil and dead skin cells which clog the pores. The pores are closed off by these materials and the surface of the pore appears white. This is the form of acne that most people are tempted to ‘pop’ or squeeze, but this should be avoided. Blackheads are the result of pores that have become clogged with sebum and dead skin cells. In the case of blackheads, the pore surface remains open, allowing you to see into the pore which appears black. Excess oil can become a breeding ground for bacteria, and as the bacteria multiply inside the pore, the pore can become inflamed and appear red, swollen and become very painful and even warm to the touch. This type of severe inflammation can form cysts, which is the most severe kind of acne. Cysts often leave permanent scarring once healed. Wearing restrictive clothing or equipment that can rub against the skin and cause irritation. Straps or other tight-fitting items that are often associated with sporting equipment, as well as bra straps and even turtleneck shirts can irritate acne. If you are on the phone a lot, or perform any activity where something is pressed against your skin or face (such as playing a violin), this can also lead to acne. Over-washing, using harsh skin care products, or not following directions for each specific product property can irritate acne. Stress. Stress can cause an inflammation response in the body as well as an increase in androgens, or male hormones, in both men and women. Both inflammation and higher levels of androgens can increase the production of oil and may increase the occurrence and severity of acne. Touching your face. Your hands and fingers contain oils that can irritate and contribute to the formation of acne. Sweat. Be sure to remove clothing after any physical activity that induces sweating, and if possible, shower to remove sweat from the skin. Hair also contains oils and if you have a style where the hair touches the face a lot (like bangs), you may experience an increase in acne in those areas. Medications. Some medications that can cause acne include corticosteroids, hormones, Dilantin (an anti-seizure medication), lithium and some birth control pills. Most medication related acne will disappear once you stop taking the drug. You have a job that involves handling harsh chemicals and oils. If your acne is mild or has not yet reached a point where you feel a trip to the doctor is necessary, there are a variety of effective products on the market for you to try. You should also follow a regular cleansing routine to keep bacteria and oil at bay. Wash the affected skin up to two times per day, and be sure to rinse well. Use warm or room temperature water as opposed to hot to avoid irritation. Use only water-based cleansers and avoid any products that contain oils or perfumes. 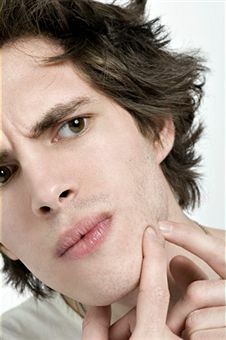 To avoid infection, increased acne and scarring, resist the temptation to squeeze your pimples. To unplug pores use Benzoyl Peroxide. To dry up blemishes use Alpha-Hydroxy Acid or Salicylic Acid. These ingredients also cause the top layer of skin to peel. To kill bacteria, use products containing Tea Tree Oil. You may find strips that were designed to unclog pores very effective. These strips are typically applied to wet skin on the face (usually the nose, chin and cheeks) and when dried, you pull them off. The sticky side of the strips pull blackheads and dirt as well as leftover make-up out of your pores. You can also find several over-the-counter kits that contain a series of products that are meant to be used as a treatment package. Some kits include heat activated products while others provide a gentle at-home alternative to microdermabrasion. There is a large market for products that are only available through the internet or telephone orders that you may have noticed on television. Skin care lines designed to combat and prevent acne such as Proactiv, ANSR Acne Care, Murad Acne Complex and Curactin all claim to be the most effect acne fighting skin care lines available and have been found to be effective. As a consumer, you need to research the ingredients, side effects and consumer reviews associated with each product, and consider the costs involved (typically around $20 for the basic starter package) before ordering. While this list of products as a whole are often effective for the treatment of acne, they may not work for everyone. The success of these products depends on your individual skin and may take some trial and error to find the product, or combination of products that treat and prevent your acne. It is very important to only use products as directed. Over-the-Counter products found at your local retailer typically cost anywhere from $5.00 for a basic cleanser, and up to $50.00 for a kit that contains a series of products. When acne becomes a burden and you are unable to find any over-the-counter products that alleviate the problem, you may choose to schedule an appointment with your doctor. During your visit, she will perform a physical exam and will ask a series of questions pertaining to your medical history, including any medications you are taking. Women may be asked about their menstrual cycle to determine if fluctuating hormones are contributing to the problem. Typically, your doctor will not need to do any special tests unless she feels that the acne is an indicator of high testosterone levels (in women). Your doctor may use one or a combination of any of these medications to help banish your mild to severe acne. Benzoyl Peroxide to unclog pores. Salicylic Acid to dry out the acne. Azelaic Acid, which unclog pores and promotes healing. Isotretinoin, which is a potent oral retinoid used to treat cystic acne and acne that is not responding to other medications. Side effects for this man-made drug can be serious and include severe headaches, chest pain, and severe birth defects. Women who are pregnant, nursing, or plan on becoming pregnant should not take this medication. Tretinoin, which is a topical retinoid. Oral or topical antibiotics like sulfacetamide or erythromycin. Women may be prescribed low-dose birth control pills such as Ortho Tri-Cyclen or Yaz. These medications are typically prescribed for women with mild acne, or acne related to their menstrual cycles. Medications known as androgen blocks which decrease the amount of oil production, such as spironolactone. Note: Common side effects associated with these medications include yeast infections in women, and diarrhea. These prescription medications can cost anywhere from $15.00 to $140 per tube or bottle. Be sure to check with your insurance provide for any potential coverage. Interlesional Corticosteroid Injection, which is injected directly into cysts that have become inflamed. The corticosteroid decreases inflammation and encourages healing. Drainage and Surgical Excision, typically used on large cysts. Your dermatologist will drain the cyst under sterile conditions. Never attempt this type of procedure at home as it can cause infection and scarring. Chemabrasion, dermabrasion and microdermabrasion, are all procedures remove surface scars through either a buffing type process or a chemical peel. Laser resurfacing which removes the top layer of skin. Gelatin implants or collagen injections which can improve the appearance of scars. Note: These treatments often require aftercare instructions to reduce pain and swelling, like applying cold compresses and avoiding sunlight, so be sure to ask your doctor about these instructions and follow them as directed. Most acne treatments, whether it is for the acne itself or scarring, take time to show noticeable improvement. You may wait 6 to 8 weeks before seeing changes and acne may in fact get worse before it begins to decrease. Clinical treatments can be quite expensive, especially those used to treat scarring. While costs vary greatly between procedures and individual doctors, procedures are typically priced from $100 to $3000 per treatment. Be sure to check with your insurance provider for potential coverage. – Avoid picking at or ‘popping’ blemishes. If done incorrectly or by using hands or instruments that have not been sterilized, popping blemishes can not only spread bacteria but may also increase blemishes and cause scarring. – Avoid skin products that contain oil or pore clogging ingredients. – Avoid products that contain harsh chemicals or perfumes as these may also irritate the skin. – Many hair products contain oils which could trigger acne. When showering, use any shampoos, conditioners or other hair treatments before washing any affected or acne-prone areas with a wash that contains ingredients like benzoyl peroxide or salicylic acid.